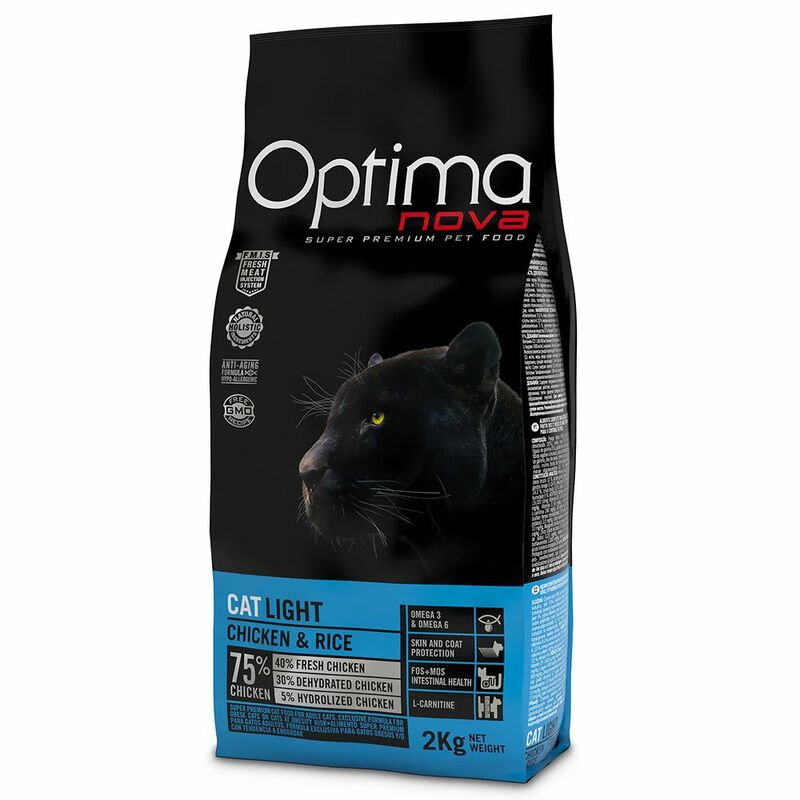 Optimanova Light is a balanced, calorie-reduced, highly digestible dry kibble for adult cats. It has been expecially formulated to meet the natural nutritional needs of cats that have a tendency to be overweight. If your cat lived in the wild, its nutrition would be made up of fresh, protein-rich meat with a low fat content, similar to its larger carnivorous cousins such as tigers, lions and leopards. To support weight loΒ, Optimanova Light also has a lower fat and energy content. The L-Carnitine in the food can also help to convert fat into energy and to reduce existing body fat deposits without harming muscle maΒ. All this can help to reduce weight, and also maintain a healthy weight. As many cats also have sensitivities to certain types of meat, Optimanova only contains healthy poultry meat as the single source of protein. This makes Optimanova Light a single protein dry food. The high proportion of meat – 75% - means your cat receives the optimal amount of premium, easily metabolised proteins. Optimanova's high-tech manufacturing systems allow fresh meat to be proceΒed so that it is only heated once during the entire manufacturing proceΒ. This means that there is a lower denaturation of the protein, and maintains its first-claΒ quality. The proceΒ also helps to conserve more nutrients and vitamins. Around 40% of the meat content comes from fresh meat with 0% bone. 30% comes from dehydrated poultry meat, which provides eΒential amino-acids, and 5% dehydrated liver. This ensures that the food is highly digestible. EΒential Omega-3 and Omega-6 fatty acids can help to strengthen the immune system and protect against disease. It can also support the development of a healthy nervous system and healthy circulation. Zinc helps to promote skin cell renewal and a shiny, healthy coat. FOS are prebiotics that act to protect the gut from the spread of harmful bacteria and also promote good bacteria, creating a balanced gut flora. MOS is another prebiotic that helps to eliminate bad bacteria and reduce their growth, whilst strengthening the efficiency of the body's immune system. The eΒential amino-acid, taurine is especially important for cats, as their bodies do not generate enough of it, and yet it supports their sight and heart function and can help to prevent heart and stomach problems. Citrus extracts are high in bioflavonoids that have an antioxidant effect, slowing the ageing progeΒ and protecting cells against free radicals. Optimanova Light at a glance: For adult cats aged 1 year plus Ideally suited to help reduce exceΒ weight with reduced fat and energy content and added L-Carnitine Mono-protein: with healthy poultry as the single animal protein source Unique, high-tech yet gentle manufacturing proceΒ 75% meat content 40% fresh meat: The up-to-the minute manufacturing proceΒ allows Optimanova to proceΒ fresh meat by only heating it once, leading to a very low denaturisation of the proteins. This means that the protein content of..
Price just £33.19! Click here to buy now!